3 weeks might be too much at once for some users. I'm sure he will have a rant about the 1M/2M memory slowing the front panel/UI response to "worm speed"
(no, not worm hole speed, not light speed ^^). But that's will be ok for "first impression" video, it would be not fair to do deep review and try to find "possitive"
things on Tekway/Hantek when he not did that for Owon or especially Instek (which is in higher price/quality class). Was there ever any serious issue with this scope like the well-known Owon noise problem? Not a single wrong unit, but many of them? AFAIK not, but? but what? Are you looking for somethign special? Something that is bad or not that good? Not a single wrong unit, but many of them? oh yes, there was between Feb 2011 and Jun 2011 hardware revision hw1005. That was first revision made by Hantek, and it was not working as expected. making these DSO useless at 1GS/s. The remaining 10% got special FPGA deisgn, making them bit more noisy but stable. Thanks. So it was solved two years ago, it's OK.
Is there a way to know if I'm 10% happy or 90%...? Are everythings interested by me? But today it can show becouse all this terrible hassle have been over long time ago. Just "fun" history. This happend when designer did not have enough experience and knowledge about what he was doing. yeah, you was not the only person who was "happy" to got newest hardware. 10/90% check is simple, when your DSO is working and you don't have such massive distorted/modulated signal like on the pictures which rf-loop posted just above my respone then your DSO is in 10% group. I have read through most of the 121 pages here and I am confused whether this scope can be hacked to 200MHz or not. As the 60MHz model is about $100 more expensive. Sorry if it has been asked already. The Bone, the Off-White, the Ivory or the Beige? to 200MHz or not. As the 60MHz model is about $100 more expensive. what a waste of time, you have to read only my very first posting on the very first page of this thread. Just watched dave's review and as an owner of this scope I'd like to know if anyone has any clue about why is the analog frontend makes the captured signal "jump all over the place", could it be his hardware revision? How can I test without that fancy evaluation board he got? check out Alan's channel. He has a very simple squarewave generator with fast rise time. It should be able to stress the scope enough. BTW I tested the holdoff-crash thing Dave showed on my scope. no sign of a crash. Indeed the scope has never crashed on me. 1. 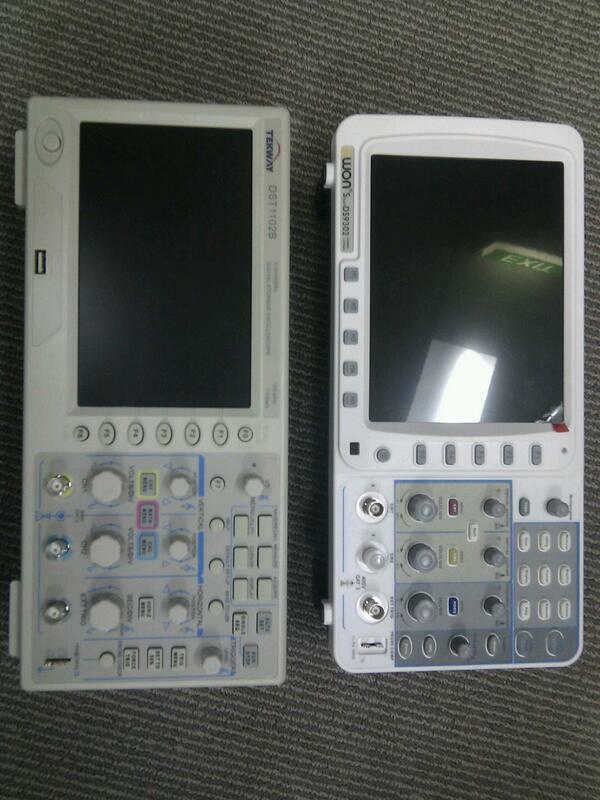 What is the out of box defective rate for Hantek DSO5102 scopes in 2013? rf-loop's image of the response to the same 16MHz sine wave of four different copies of the same Hantek model looks pretty scary. It also makes me seriously wonder if the horrible pulse response Dave got in his review of the Tekway DST1102B may have been due to a defective scope front end and maybe just in one channel (assuming that the Tekway and Hantek use the same main board). 2. What is the difference, if any, between a Hantek DSO5102B and a DSO5102P? No US suppliers I see on eBay carry the P model, those are only available directly from China, but I'd prefer buying from a supplier in the US in case there are issues with the scope right out of the box. 3. Does the Hantek DSO5102 use the same on-screen menu structure and font as the Tekway DST1102 shown in Dave's review? The same hardware? 2. What is the difference, if any, between a Hantek DSO5102B and a DSO5102P? B has 1M memory, P has only 24K. Other than that, the specs look identical. and "P" model have brand new mainboard (which contains different SoC and DDR memory), newer Linux (3.x). Thanks for that info. Found the web page for the "P" version and it looks like it's just an attempt to lower the cost of the scope which makes sense with the lower memory count. Thanks, couldn't find any specs on the Hantek site, they just listed their "DSO5000C Series" with no real info on it in English. Whoops, just found some info on a Hantek site, might have been on a satellite site of some kind before. Other than the smaller amount of memory, is that new mainboard better than the old mainboard or did they simply redesign it to lower production costs? they redesigned the PCB because the main SoC is EOL. Now they using Samsung S3C2416 instead of S3C2440. Was the Hantek DSO5102B with the older mainboard just the Tekway DST1102B hardware and firmware sold under a different brand name? afaik Hantek nd Tekway belongs to same shareholders, they did a merger to optimize production costs. On the other side they selling still under own names (even if firmware is actually owned by Tekway and mainbaord produced by Hantek) and Tekway costs more (on the other side i know they running burn-out tests). What else behind, no idea, this is all they told me. OK, thank you for that very helpful info. It really clarifies things. Is this model compatible with the hack?